The massive protest rallied against the proposed security bill everywhere last weekend. So-called “Abenomics” is falling flat on its face every time we look at figures and our purses despite the strong support from the Novel laureate. Abe’s political moves are not as bright as they used to be. However, there is still one hope left. Japanese economic leaders are hoping 2020 Olympics will brighten the long-term prospects for market demands in construction and service sectors. The gigantic new stadium was planned: its projected cost: $ 2 billion and more. Of course, it’s good news for Taisei-Kensetsu and Takenaka Koumuten, who are on the way to sign the contract. But apparently, nobody knows who is willing to pick the bill. The original plan, designed by Zaha Hadid, has become the center of debate and ridiculed by many. Then, the government decided to scrap the original plan to thrash the cost. To reduce the cost, they are thinking about removing air-conditioning. It’s probably reasonable if the Olympic will be held in autumn or spring. But the planned schedule is in August. The average daily maximum temperature in August is over 30 C in Tokyo. Actual temperature in the crowded areas are much higher, due to massive air conditioning exhaust from the every building around the town. It is as clear as August sky in Tokyo that many audiences will get critically sick from overheat. So the government plan includes the more first-aid offices. Don’t worry. Welcome to the nation that created Battan Death March and the Battle of Imphal. As a series of bad decisions, inner-circle politics, and unkept promises have become visible one after another, the 2020 Tokyo Olympics seems to be doomed at this point. The official logo design was scrapped because of the allegation of plagiarism. The discussion still continues on Facebook, Twitter and elsewhere, questioning the logo designer’s professional ethics, the process of the selection and the “incestuous” relationship within the Japanese design industry. By “incestuous”, I mean the reciprocal relationships among some of the “top” Japanese designers to award the prizes in competitions etc. Sometimes a designer becomes an award receiver and in the different occasion, the same designer sit in the committee, giving away the award to the one who gave him/her the award previously. You are thinking, “well, other Olympics were like that, it’s loaded with special interests.” I agree. As I discussed before, this 2020 Olympic is the third Olympic scheduled in Tokyo. 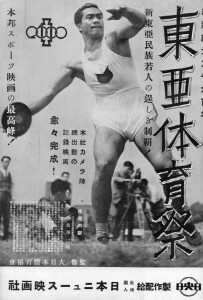 The first Tokyo Olympic (1940) was canceled due to the political climate at the time. However, in 1940, Japan managed to host “Eastern Asia Competition” in Tokyo. Athletes from 6 nations (Japan, Manchukuo, Phillipines, China, Hawaii and Mongolia) attended the event. Actually, it was the self-serving, self-promoting, self-centered and self-indulging event, most of the medals were awarded to Japanese athletes. Below are the advertisement for the documentary of this Competition, released in December of that year. It seems this film is not available to us. Maybe, rotting on the shelf in some forgotten archive or storage. 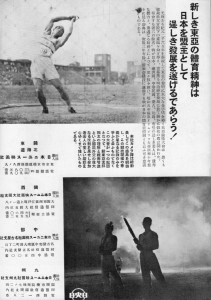 However, you can watch the event recorded in the Japanese newsreel from June 1940. This level of self-gratification must have been very satisfying to many people. Today, I observe international sports are less and less nationalistic though fiercely competitive. Of course, the athletes represent their country, but in more relaxed way. But whenever I see Olympics and other international events on Japanese TV, I feel uneasy and uncomfortable. The whole tone of the Japanese media is becoming more jingoistic and self-gratifying. Many organizers, committee members and politicians discusses prospective number of gold medals so unscrupulously that it just put unnecessary pressure on the athletes. Whenever I see or hear these comments, I feel like I am living in 1930s. Oh, by the way, there are Japanese people who claim the Battan Death March has been exaggerated by Fillipinoes and Americans to overemphasize the cruelty of Japanese military. So, if you are planning to visit Tokyo Olympic in 2020 but afraid that you may get sick from overheating, beware: they may tell you that you are exaggerating.